Editors of Prevention, Cassandra Forsythe, M.S. 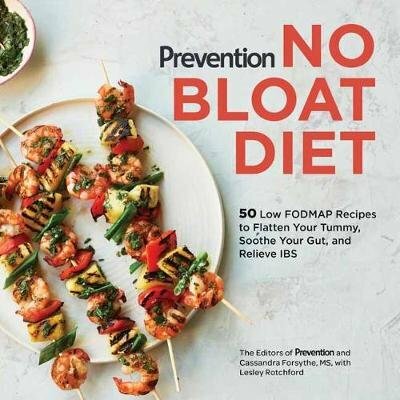 Say goodbye to gas, bloating, stomach pain, and constipation and take back your gut health with a low FODMAP diet from Prevention magazine! Cassandra Forsythe has struggled with gastrointestinal issues ever since she can remember, trying every medication, treatment, and meal plan she could find. Finally, she discovered the low FODMAP diet—and it completely changed her life. FODMAPs are a group of specific short-chain carbohydrates that can be hiding in both healthy and unhealthy foods, such as cherries, some nuts, and garlic, and can wreck havoc on digestive systems of people who are sensitive to or intolerant of them. Ecstatic about her quickly disappearing GI issues, Dr. Forsythe began blogging about her experience, and immediately found that she was not alone. People from all over the world started to contact her, sharing their stories and asking for guidance and advice about the plan. If you are sick and tired of being bloated, gassy, and irregular; have been diagnosed with IBS and then left hanging with no clear treatment or solution; or have tried every medication, probiotic, and miracle cure available, then look no further—the No Bloat Diet is the ultimate guide to taking back your life and health. Authors: Editors of Prevention • Cassandra Forsythe, M.S.